I thought I would take a moment to update my dear readers on what other food-related events have transpired recently in my life. First off, my second article has been published in Edible East Bay! 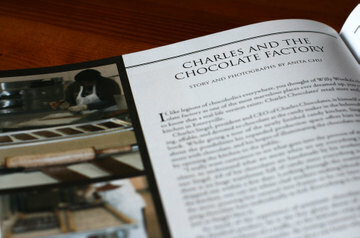 You may remember that I toured Charles Chocolates’ new factory and store a while back; now the full story plus photos I snapped of the production line are in the Fall 2007 issue of Edible East Bay. Just be careful when pronouncing that name aloud in polite company! 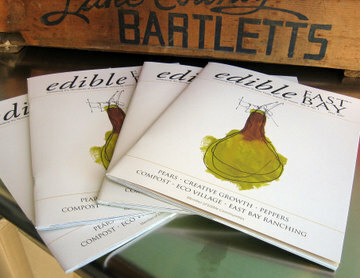 If you aren’t near a copy of this issue of Edible East Bay, they will soon post up electronic versions of the articles on their website. You can also read my earlier profile of Charles Chocolates. 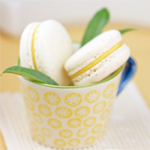 Second, I’m happy to announce that Sarah Phillips of Baking 911, one of the most comprehensive and helpful baking sites available on the net, invited me to contribute to her monthly newsletter. Sarah is one of the nicest people I’ve ever met, and a fabulously accomplished baker: I am amazed at the amount of information on her site, from recipes to step by step tutorials for making just about anything in pastry. 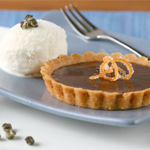 I’m very pleased to be part of Baking911, and for the November newsletter I’ve created a recipe for a chocolate caramel pie – a wonderful addition to the holiday table! 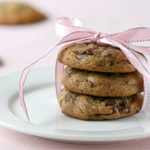 In order to view the newsletter, you will need to become a premium member of Baking911. Membership is $24 a year, but Sarah is currently running a promotion where membership will only cost $14 if you join before the end of the year. Read here to see all the benefits of becoming a premium member. 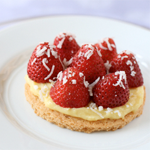 Even if you don’t join Baking911, I hope you still find it a useful baking resource – I’ve found many of her articles helpful when researching a recipe or pastry technique. 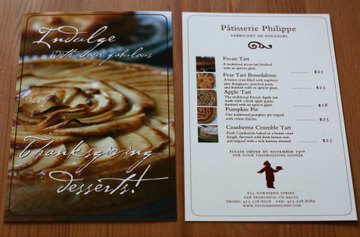 Finally, the capper to a really lovely weekend: I got to see the advertising cards for Pâtisserie Philippe – with my photography on them! You may remember me rhapsodizing about Philippe’s peerless pastry; I recently did a photo shoot for his holiday line and now the Thanksgiving advertising card is out! There’s just something about the tangible realness of a photo on smooth, substantial stock that’s completely different from an image on a computer screen. If you have MooCards, you know what I mean. I have to admit it was quite thrilling to see my photos hung in the store windows and on the beautifully produced cards. I was also very relieved when Philippe told me he thought the pictures looked "like (he) wanted to eat them," – so glad I’d done justice to his creations! 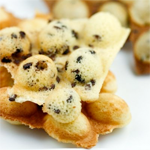 If you live anywhere near Pâtisserie Philippe, I urge you to pick up one of his desserts for Thanksgiving; I can personally assure you they are all fantastic. If you want a closer look, descriptions along with some more of my photos are on his holiday menu, and you’ll get a bonus peek at a shot I did of his Yule log! 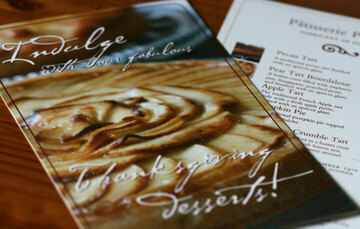 You may have noticed the outrageously beautiful apple tart on the front of Philippe’s card; he gave me one to take home after the photo shoot and I ate about half of that! Check back later this week to see my humble take on this apple tart! 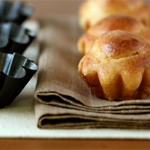 « Don’t Judge a Cake by its Pan – or Should You? Wow! Congrats are in order, three fold! Girl- you are SO talented!!! Oh my! I’m so excited for you. Congratulations! Oh Anita! such exciting things you are up to. Congratulations! P.S. I had to read the name – Mt. meenao several times before I got it…:). u have 3 times the reason to celebrate ! The pictures do look fantastic and u must feel really happy n on top of the world to see them there. Wow, you’ve been busy! Congrats on all your published work. 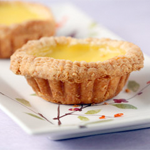 Your tart for Baking 911 looks great!!! That’s fantastic Anita! Congratulations on all counts! you totally deserve it. Wow what a wonderful week for you. You truly deserve it though after all your hardwork. 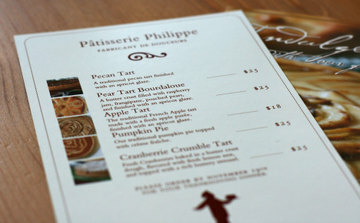 The advertising cards for Pâtisserie Philippe are so beautiful. Wonderful photos. 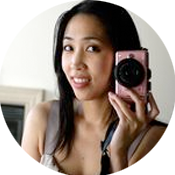 Hi Anita, heaps of congratulations to you! 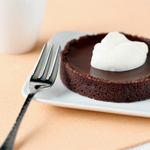 That chocolate caramel tart looks too good and wow, to see your photos on real paper. I can relate to the feeling. Just saw some of my photos on a local restaurant’s menu. Keep up the good work and enjoy baking. 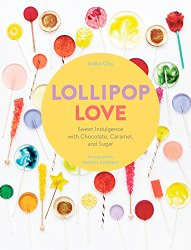 Many congrats for all this great work Anita. To many more jobs like this! You are so talented and I truly enjoy everything you do! Congrats on all your success darlin’! congratulations to you Anita! 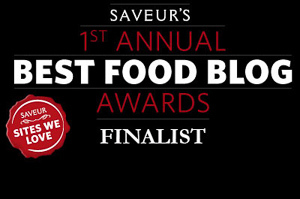 you’re such a wonderful woman and very talented obviously….kudos to all your great work in the food industry! Oh that feeling of pure satisfaction! 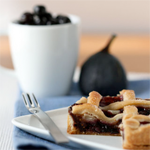 As good as Philippe’s apple tart, I bet! Congratulations! You deserve every bit of it!! Well done Anita. You absolutely deserve every bit of it. So happy for you. I should agree with Philip, your picture makes me wanna eat everything you make. Baking 911!? Totally sweet! 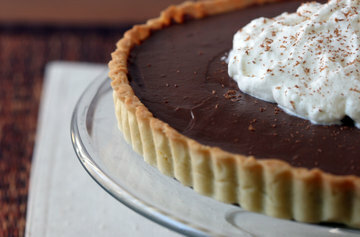 In fact, as sweet as that chocolate caramel pie you mentioned. Congratulations! Thank you!! Did you ever try the Buddha’s Hand? I’m not a huge vodka drinker, so the large size of the bottle plus the price kept me from getting it to make the chocolates! Thank you! we definitely will celebrate soon! Thank you! It’s been fun doing all these different things! Thank you so much! I’m glad you enjoy my site, it keeps me motivated! Thank you! I’ve just excited and grateful to have gotten these opportunities! Thank you! It is great to see the results of your work in “Real life”! Thanks so much, your words are very appreciated! Thank you! I did feel quite busy the last few months, but I’m glad it’s paid off! Thank you! that’s fantastic news for you too, I always knew I’d see your photos and writing published – great job! Thanks so much! It was fun and satisfying – best jobs possible! I’ve corrected the link – thanks again for a great newsletter! Aw thanks! I’m just glad that all these great people stop by my blog! Thanks so much! It’s exciting to be involved in such a fun industry! Thank you! Anything having to do with food is fun for me! Thank you! 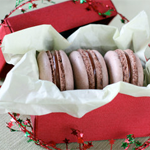 It was a new thing to take pictures of someone else’s baking – good thing his were so perfect looking! Thank you! Who would have thought I’d end up doing all these things! Thank you! Yes, Baking911 is a great site, isn’t it?